Coronary angioplasty is a non-surgical process in which the contracted passage in the arteries is broadened. The walls of the arteries thicken which makes them stiff and in severe cases, gets completely blocked. This medical condition is termed as Atherosclerosis and to counter this ailment, angioplasty is performed. Below mentioned are the basics of coronary angioplasty. Who is a candidate for Angioplasty? Medicines can restrict the hardening of the arteries and assist in removal of the deposited residual on their walls. But when the situation ceases to improve and the condition worsens, an angioplasty of the coronary arteries is the only option. Due to reduced flow of blood in heart and other vital parts of the body, an acute pain in the chest is felt. In medical terminology, it’s called Angina. Most common symptoms of angina include difficulty in breathing during a physical activity and under stress. Also, this procedure is advised to improve the supply of blood to the heart for its smooth functioning after a heart attack. What happens during Coronary Angioplasty? A minute tube called catheter is implanted in the artery by making a small cut in the groin, arm or wrist. A balloon like substance is passed to the affected area with the help of a slender thread. The balloon is then blown to broaden the artery, consequently shedding the unwanted disposal on the walls. This ensures smooth and additional flow of blood even when the balloon is punctured. However, in extreme cases, a stent may be required to be inserted around the balloon. In such situations, when the balloon is inflated, the stent also enlarges but after the flattening of the balloon, the stent remains intact. Thus the passage remains widened allowing free blood transmission. During this process, a local anesthesia is administered to the patient and all the proceedings are carried out while he is conscious. This procedure is generally completed within thirty minutes to two hours. The person is allowed to return home after some hours of care from the hospital if treated for Angina. Whereas, in case of a situation as serious as the heart attack, the patient is kept under observation for some days. Read about the Coronary Angioplasty procedure in detail. This treatment does not include major surgery, therefore a majority of the results do not pose any serious threat to the lives. In some exceptional cases, the aftermaths can be too dangerous like extreme blood loss, heart attack or a stroke. Also, when a person already carries any significant kidney related problem, he is at much higher risk of developing complications later. Some medicines may also be prescribed after this procedure to prevent any blood coagulation that may form in the arteries. 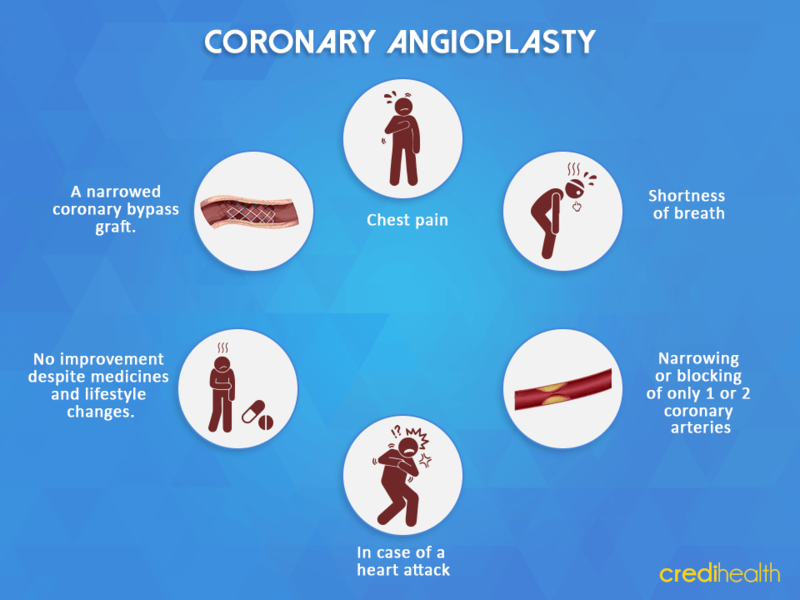 Coronary angioplasty gives temporary relief as there is no structural change in the body, therefore procedure is simple but carries some risk. It is important to be aware of the precautions one needs to take to benefit from this for a longer term.